Here at LS Forklfits we aim to supply only the best products we can, this has led us to a partnership with Donghua Chains. We are no an offical suplier of Donghua chains. We now can supply 17 different variations of chain. All information on each chain is supplied such as weights, dimetions and the nominal bearing load. The Hangzhou Donghua Chain Group, based on the east coast of China and producing in excess of 30 million metres of finished chain per year, is one of the world’s biggest chain manufacturers. Only one Standard. The Best. Donghua's primary focus is the quality of its chain, and the company's commitment to R&D has resulted in specialist and innovative chain production; often customised to clients' requirements. Employing their own hardening facilities, advanced surface treatment techniques, and with the ability to deliver roller chain in tolerances within 0.5 DIN accuracy in a wide range of materials and alloys, Donghua chain provides high-performance solutions across industrial, agricultural and specialist applications. With head-quarters in China and offices throughout Europe, Donghua chain has been supplied to the European market for over 20 years but sold under more popular western brand names. However, changes in corporate strategy and the inauguration of its UK operation now means that chain can be sold directly in the UK under the Donghua brand name. Donghua Limited was set up in the West Midlands, UK in 2009 occupying purpose-built premises, with over 7000 sq feet of warehousing holding 800 tonnes of chain. In 2016, the company moved to larger premises on the same industrial park increasing the warehouse capacity to 25,000 sq feet. It is strategically placed to supply and service its growing national network of UK Product Partners, Stockists and Distributors. Key players in the UK's chain sector have joined Donghua Limited to become local suppliers of Donghua's extensive range of products which includes: Roller Chain, Leaf Chain, Conveyor Chain, Agricultural Chain, Attachment Chain, Bespoke Chain and Heavy Super Power chain. 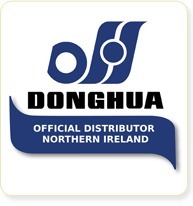 Our UK-wide dealers have access to a range of supporting material including point of sale (POS) with which to promote the Donghua chain within their trade counters/outlets.